In this debut picture book, a snowflake experiences his life cycle of forming, falling, melting, and materializing again. Near Vancouver, Canada, as the sun begins heating the ocean, a process begins: “The water started to evaporate. The water turned into a vapor. This vapor formed molecules.” Going CRACK, BURR, SPRONG, and other exciting verbs, Icy the snowflake is born. He’s a happy fellow with a round red nose who loves being up in the sky and then falling into a blanket of snow. But as more snow piles on top, Icy finds his world becoming dark, cold, and compressed. After 200 years of this, he’s frightened and sad. But then the glacier he’s part of splits, and Icy enjoys an ocean voyage, meeting several animals who cure his loneliness. As he melts, though, Icy despairs, until warm air lifts him upward and he again becomes a snowflake. In his tale, Friend introduces children to some basic scientific concepts. But parents may need to explain some of the vocabulary, such as “evaporate” or “molecules.” While Icy is a poignant figure with his long years of melancholy and solitude, the story’s emotional logic doesn’t make much sense. Why is gloomy Icy the single sentient snowflake? The book also misses a chance to address the climate change that’s responsible for too many melting glaciers. Debut illustrator Makis’ images are expressive, though the crayon technique and drawing style look homemade. 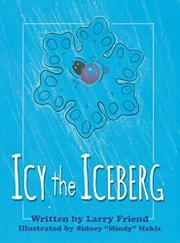 A simple tale that shows kids how water becomes snowflakes, then ice.